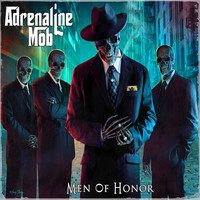 I would say if you haven’t heard of ADRENALINE MOB, it’s time to start using your ears. These guys have been rampaging across the globe since the release of their debut album “Omerta” and its follow up EP “Coverta”. Now featuring the talents of Disturbed bassist John Moyer and drummer Aj Pero in place of Paul Di Leo and Mike Portnoy (yes that Portnoy) the band is running full steam ahead with this new release full of fire and guts. “Mob Is Back” kicks things into motion here opening with the tumultuous sounds of a band firing on all cylinders, powerful guitars and drums leading the way here. A drum fill signifies the beginning of the first riff, containing a powerful groove and really heavy guitar riffs. The mighty vocals of Russell Allen are on full display here, with a really ballsy sound and a hell of a lot of attitude. This is a really strong start to the album, plenty of great playing and sound and a really tight performance. “Come On Get Up” is one of the songs most people will have heard now, having been put up on YouTube by Century Media. This is another cool one with a lot of attitude, with a really powerful verse with heavier riffage, and some really deep vocal grit from Allen. The chorus is one of my favourite on the album though, with a really nice melodic sound supported by a really great bassline. The solo is really cool and “out-there” sounding which adds a nice extra element to the proceedings here. “Dearly Departed” is a really awesome and dynamic track, with some softer guitar playing and a really emotive vocal performance. The main riff has a really good sound to it, and almost borders on a FOO FIGHTERS style sound that actually really works well for the song. Russell is by far a better singer though and really makes this song stand out. “Behind These Eyes” begins with some awesome layered clean guitars, and has a really nice sound to it that builds up and becomes a bit heavier later on. The band really shows it’s talents for making lots of different styles come together in perfect harmony here, with great playing all round, from the laid back guitar playing that becomes much heavier later on, to the super supportive rhythm section and the really well performed vocals. “Let It Go” hits us hard again, with a full frontal riff assault. The meaty main riff of this song is great, able to hold a groove whilst also showing off some serious chops from all the guys involved. The vocal performance here is another really heavy one, with another fantastic chorus here. This is probably the shortest song on here, but delivers rather a lot anyway. “Feel The Adrenaline” is another really heavy song, with a really grooving beat to it, and some really great riffs that really hit the point home. Another great vocal performance here as well. This one’s a bit more of a straight ahead rocker but works really well, with a really nice slowed down section with some awesome vocal harmonies later on, that is brought to a speedy close by an awesome bass guitar part. Things almost take a back seat for title track “Men Of Honor”, with some nice clean guitars and string sections before suddenly smashing in with a really heavy riff. This is a really angry sounding song, especially in the guitars and vocals. The chorus is another really powerful one, something that Russell Allen may just never get wrong in anything he does. “Crystal Clear” is a nice contemplative song, with some really nice acoustic guitars, great laid back drums and a really well performed bassline from John Moyer which really shows off his diverse abilities as a player. This is a really good song that really shows off a different perspective of the band’s sound. “House Of Lies” brings the heavy back for what may be one of my favourites on this album, with an awesome intro and main riff, underlined by a really dynamic performance from Allen. Really tight playing really strengthens this song and it has a super heavy sound and yet another fantastic chorus! “Judgment Day” is the last full on heavy track on the album, and gives us lots of riffs to remember them by and an awesome solo too, another assault to the eardrums here, and all the better for it too! The album closes with “Fallin’ To Pieces” which is a gentler song that gets a bit heavier later with one last powerful chorus to finish things off. The band comes together to make a really nice overall sound and feel here, and it finishes off the album really nicely. The production here is sublime, world class as you would expect from a band at this level. Everything is nice and loud, yet the clarity is also great too! “Men Of Honor” is a fantastic follow up to “Omerta”, a bit more powerful and strong a release than the last, certainly worth your time if you’re a fan of proper Heavy Metal with really strong vocals. Truly, The Mob Is Back.